Information from customers:Passport No, Full name, Date of birth, Nationality, Hotel name with contact No. and Address. Meet your group and English speaking guide at the meeting point, walk 5 minutes get to the entrance gate of Zhangjiajie national forest park. Your day tour kicks off. Take a ride on Bailong elevator (Included), An unusual glass construction built on the side of a cliff, this lift holds a number of records, not least for being the world's highest outdoor elevator, at 326 meters.Yuanjiajie where you'll visit the Enchanting Stage observation point and get fabulous views of the towering pillar-like rock formations which provided inspiration for the other worldly scenery in the movie Avatar. You'll also see the No. 1 Bridge under Heaven, a natural bridge which stretches precariously between two mountains over a deep chasm. Enjoy Simple Chinese style lunch at a local restaurant. After lunch, head to Tianzi mountain, Located in the northern part of the UNESCO World Heritage listed Wulingyuan Scenic Area, Tianzi Shan stands at 1,262 meters above the sea level,it is the highest peak in the area, where you will have a stunning views of cloud seas, jagged peaks, deep valleys and magnificent wild scenery which changes appearance with the seasons.You'll also visit Helong Park where you'll find a large bronze statue of the Great General who did a great job in China's Liberation. After that, you can make your way down via cable car (For an extra charge at 72RMB/PERSON), or you can take a challenge to hike all the way down through the south gate. (Roughly 6,000steps). After the tour finished,you will have a chance to learn the culture of Chinese Tea as well as taste the local tea to relax and fresh up yourself, afterword, driver will send you back to your hotel. Tour finish around 5:30pm. This fantastic performance is a famous singing and dancing culture show in china which will impress you deeply on ethnic folk culture with folk flavor, features song, dance and acrobatics performed by members of Tujia and Miao ethnic minority groups, dressed in all their traditional finery. This show combines traditional arts and culture with modern stage. 1.Please Take your passport with you when you departure from your hotel. 2.We need your great patience to wait for the cable car, elevator,bus or line up to get into the secnic area during the peak season. 3.Please follow your guide's insturction and suggestion duiring your tour with the group. 4.Please ensure personal and pick up information you provided is correct. We are not supposed to refund any losses that result from incorrect and missing information. 5.You are not supposed to receive a refund for any part of the activity that you miss if you leave the group for any reason. Meet your group and English speaking guide at the meeting point, walk to the cable car station of Tianmen mountain. Your day tour kicks off. 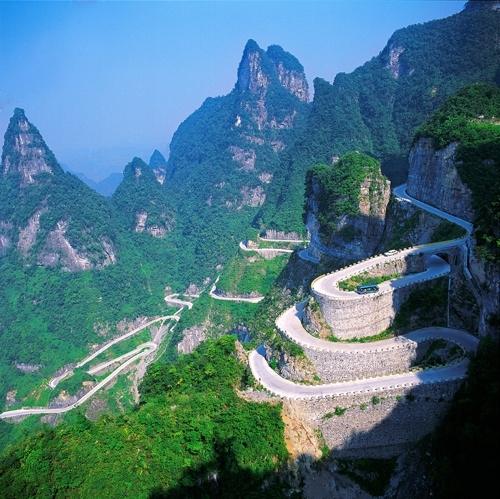 then, get ready to take The world's longest gondola up to Tianmen Moutain.The Tianmen Mountain Cable-way is claimed in tourist publications as the "Longest passenger cable way of high mountains in the world" with 98 cars, total length of 7,455 meters, and ascent of 1,279 meters at an unusual grade of 37 degrees.You may walk on miles of paths built onto the cliff face at the top of the mountain, including sections with glass floors, which is also known as the sky walk. There is escalator, built inside the mountain, will take you to Tianmen gate and 999 steps, you can change the 999 Steps by hiking or can take another escalator(Option: cost 32RMB) get to the bottom of the steps Tianmen mountain is not only a common attraction in Zhangjiajie but also a place attracts special people, Dawazi,from Xinjiang province, challenged the Tight rope walking between two mountain, the pilots have flown through Tianmen cave for many times, The rock climber Alan Robert climbed up to Tianmen cave,The brave people do the wing suite flying on the mountain. everything here makes Tianmenshan a must-see attraction in Zhangjiajie. Then you will have a chance to learn the culture of Chinese Tea as well as taste the local tea to relax and fresh up yourself,afterword, you also get a special opportunity to admire the unique art of Sandstone Painting, it is a style of creative art made from natural and perm-colored materials, namely, sand, fragmented stone and portions of plants.driver will send you back to your hotel. Tour finish around 5:00pm. Note: We may use cable car up and finish the tour with bus ride or use bus ride up and finish the tour with cable car ride. Our guide will adjust it according to the actual condition . Full name details with passport No. 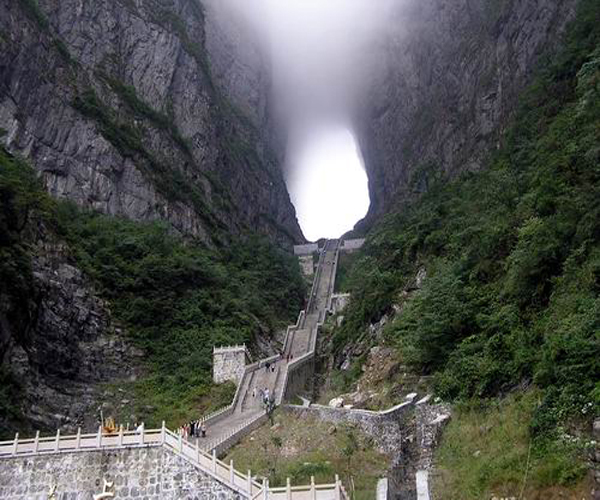 Is required when book the tour,we only accept a booking at least 2 days prior to the departure date as it required a full and correct name to book the ticket for Tianmen moutain. Originated from a traditional Chinese myth and folk tale “Love Between wood cutter and Fox” is known as the world's most beautiful real-scene musical drama with the high mountains and deep valleys as the stage background. The musical drama integrates the elements of folk music and modern lighting.You will never forget the sweet singing, charming dances, and mystery and beauty of the show for your whole life. 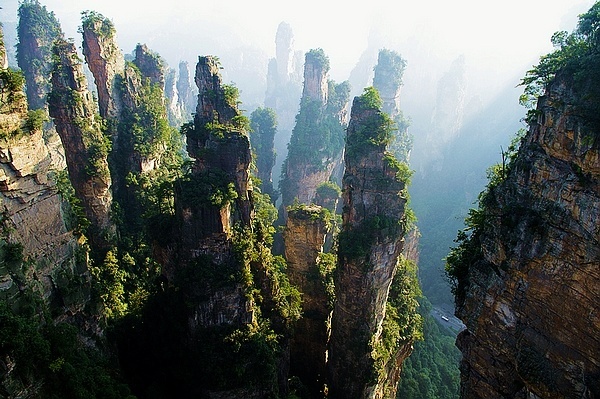 It should be one of the highlights and A Must-see for everyone who have chance to visit Zhangjiajie area. Information from customers: Passport No, Full name, Date of birth, Nationality, Hotel name with contact No. and Address. Meet your group and English speaking guide at the meeting point, Car ride to Zhangjiajie Grand canyon, Your day tour kicks off. 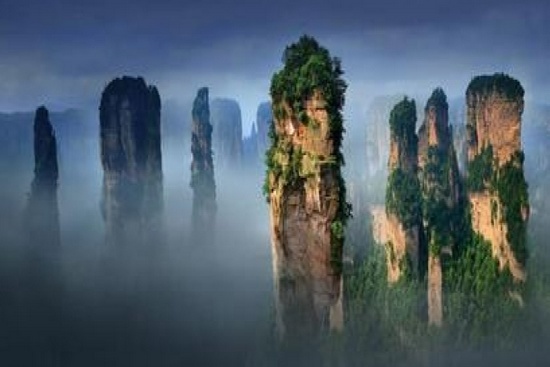 Star your adventure to Zhangjiajie Grand Canyon,which is much favored by explorers and lovers of great outdoor from home and abroad, by featuring typical Zhangjiajie landform, breathtaking cliffs, lush forests, ancient caves, colorful ponds, and a river running through the canyon. What's more, visitors can expect all sorts of scenery of the north temperate zone here. 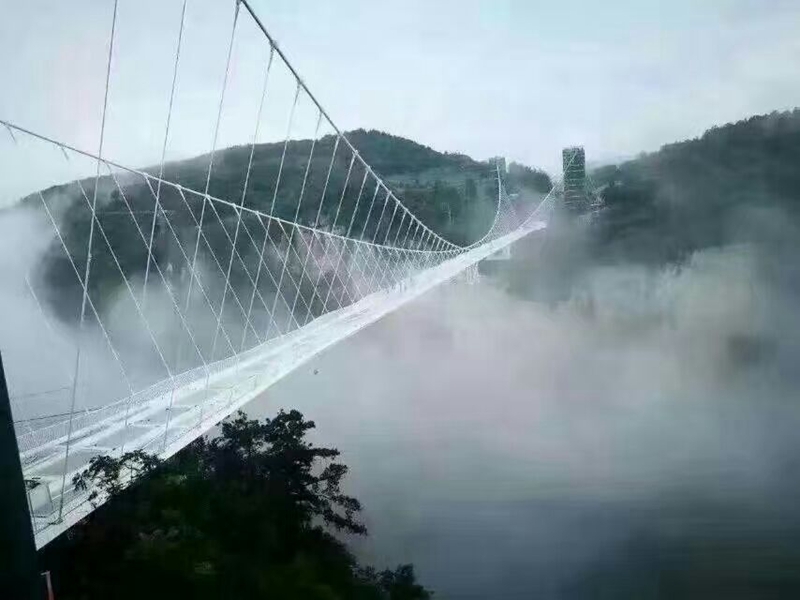 Therefore the canyon is ideal for exciting adventures by hiking, boating, challenging the slide and zip Line, Here you can see the highest and longest glass bridge in the world, You will enjoy a scenic walk boasting waterfalls and wonderful views on each side. 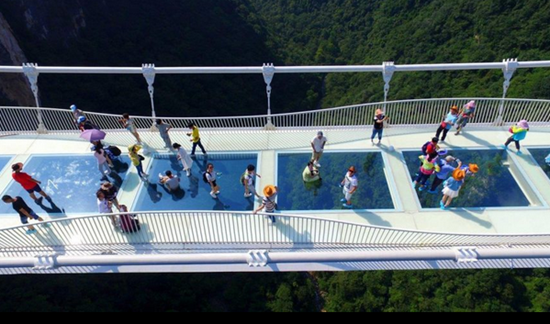 The glass bridge is built between two mountains of zhangjiajie Grand canyon, it is 375meters long and 6meters wide, With a height of 300meters from bottoms). Halfway down, there is a 600-meter-long marble slide, winding its way down to the bottom of the valley (It is optional, you can also choose to hike down). Visitors are given a thick canvas to tie around the waist and a pair of gloves to protect the hands (Option:cost 22RMB in total) You will learn how to control the speed of sliding down and have a lot of fun. After 1 hour hiking in the Valley, you will have a chance to experience the Zip Line(Option: cost 30RMB),Visitors use their own weight to swing from one mountain to another quickly by sitting on a chair with a safety jacket. Then you will have a chance to learn the culture of Chinese Tea as well as taste the local tea to relax and fresh up, driver will send you back to your hotel. Tour finish around 4:00pm. Note: We only accept a booking at least 1 days prior to the departure date as it required a full and correct name to book the ticket for the Glass bridge. Full name details with passport No. Is required when book the tour. This fantastic performance is a famous singing and dancing culture show in china which will impress you deeply on ethnic folk culture with folk flavor, features song, dance and acrobatics performed by members of the Tujia and Miao ethnic minority groups, dressed in all their traditional finery. This show combines traditional arts and culture with modern stage.